When Coca-Cola International Services in Drogheda commissioned a piece of art for its offices, the company called on its staff to engage in the process. The subsequent collaboration between staff members and the two commissioned artists resulted in a unique large-scale mural, which has surpassed the expectations of all involved. Coca-Cola International Services opened its offices in Drogheda in 2011, with its staff providing financial services for the company worldwide. 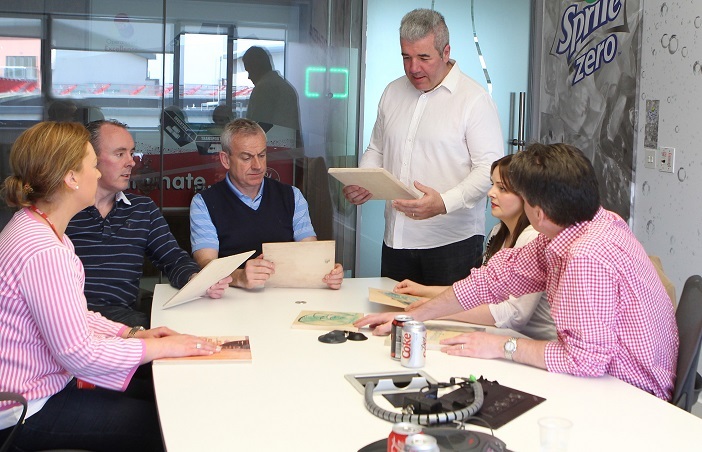 In 2013, Jack Gogarty, Coca Cola’s global finance operations, client services director, for Europe, Eurasia and Africa, wanted to create a visual expression of what the Drogheda office does. The company called on local artist Kieran Gallagher of Kada KaBoom Arts, who in turn asked Kilkenny artist Thomas Duffy to also come on board. “We were trying to express our relationships with clients, to show the value and good we do but also to create something that visually represented how we felt about ourselves,” says Gogarty. In order for that evolution to take place, staff had to be involved in the process. A group was formed from across the global financial operations team. Gallagher and Duffy wanted to start with a blank canvas, and to create a fluid process where they worked with staff on idea generation. They facilitated workshops and ensured that each member of the team was comfortable expressing their ideas and aspirations. “Coca-Cola had a very specific idea of what they wanted to portray, which was how the company links up with different parts of the world and their efficiency. It was a very ‘corporate’ idea at the beginning, but we wanted to get to the heart of the organisation,” says Gallagher. “I’m a process-led artist. I start a piece of work, juggle all the factors, and in the act of juggling come out beyond what we imagined from the start. That’s what happened with the Coca-Cola project. It’s quite an engaging piece that exceeded expectations,” says Duffy. After a number of meetings, the concept for the installation – Bridges – was born. The artists portrayed images from around the world, but shied away from the obvious landmarks such as Big Ben and Taj Mahal. They put them into a mural comprising approximately 72 10 x 10 inch square blocks, flowing across a main wall in the building. What really brings the mural to life is an ode to the Boyne cable bridge in Drogheda, with steel cables extending out from the wall. “The scenes are associated with various parts of the world, but you would only know them if you have been there. For example, there’s a train station in Madrid that we used, while we used an image of a chair in Paris rather than the Eiffel Tower,” says Gallagher. Such has been the impact on staff, that in a recent employee survey, all of those involved with the project said it was the thing of which they were most proud. “It has had such amazing feedback from a whole variety of people. Our associates feel it is something they relate to, something that really represents us as a group of people, and as a significant contributor of value to Coca-Cola,” says Gogarty.